Here are your favorites, Crayola colored pencils, in a water-soluble form. Use them with a wet brush or dip the pencil in water and draw. 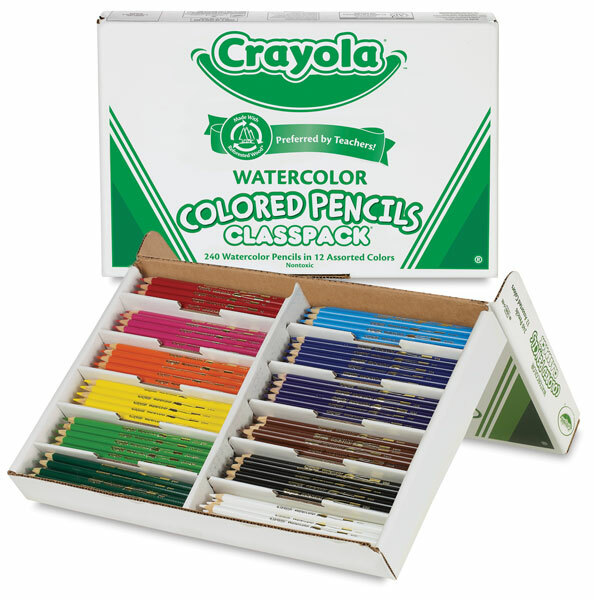 Crayola Watercolor Pencils are non-toxic and conform to ASTM D 4236. A classroom assortment of 240 popular watercolor pencils, pre-sharpened, in a convenient sturdy box. This Classpack contains 20 pencils each of 12 vibrant colors: Red, Blue, Green, Yellow, Violet, Orange, Black, Brown, White, Sky Blue, Magenta, and Yellow-Green.